Hello! Thanks for visiting! Scroll down for updates on recent projects! Back in 2016 I went on a road trip to California and while at Renegade in San Francisco I came across a vintage Levi’s jacket that I fell in love with. I knew then that a Harley Davidson patch I’d found years before in a charity shop, finally had it’s home! And so a patched jacket love affair began inspired by Gucci’s incredible patch jackets and endeavouring to create my own (affordable) version I began collecting and then designing my own patches! 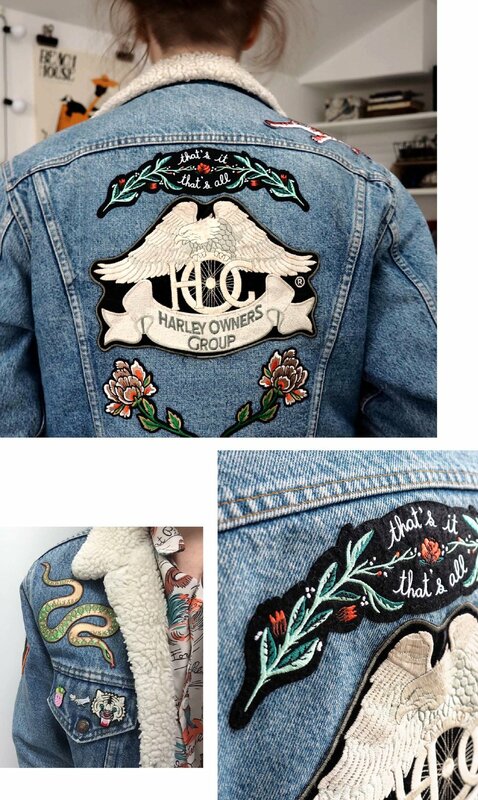 I have a pinterest board dedicated to denim jackets and patches! So the first step was adding my large vintage back patch plus some florals and circular patches from one of my favourite indie designers Stay home club and a tiger pin on the front from incredible designers Macon & Lesquoy I basically want everything they do! Next I got obsessed with incredible embroidery artist Ellie Mac and after laying down some seriously not subtle hints my beau got me two botanicals and a bee for Christmas, plus a cheeky prawn which is on the sleeve. I also developed my first patch; a tiger taken from one of my illustrations and I sewed him on twice, just because! The Tiger patch was really popular so at the beginning of 2018 I designed a whole family of patches inspired by my Love is power and Hope is Fearless Screen print series. But I’ve been rubbish and haven’t added them to my jacket! However the temperature has recently dropped and all I want to wear is my denim jacket, so I’ve finally gotten around to adding them! See the GIF below capturing the curation excercise that is; deciding what goes where! A curatorial excercise; figuring out where to place the patches! This Saturday I went walking with In Colourful Company in Camden and I knew it would be the perfect opportunity to get some colourful shots of my newly patched jacket! Check out my posing skillz below! I’m definitely not done though, there is still room for more! I’m always on the look out for great patches so comment below if you have any recommendations! The finished jacket, so far….! Top tip! Decide what garment you are going to patch and then collect a few patches that work together before you start sewing. I I’ve found that if I add them one by one I’m not happy with the composition and I end up moving them!